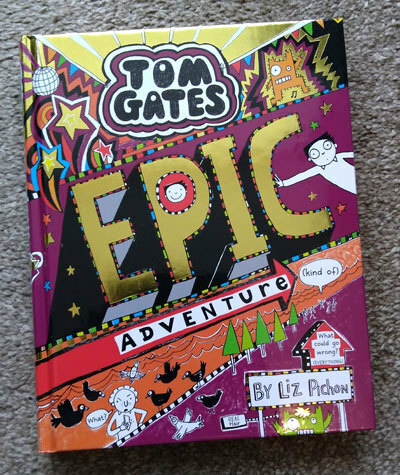 Read our review and recommendation of the Tom Gates books by Liz Pichon below. We also answer the all-important questions of how many Tom Gates books are there? And what order should they be read in? How many Tom Gates books are there? As of October 2018, there are 15 books in the Tom Gates series. Below is a full list of all the Tom Gates books by Liz Pichon. This includes the latest Tom Gates book – What Monster? It was released in hardback in Autumn 2018. Keen fans may also want to know that there was also a 96 page World Book Day special released in 2013. There was also a Tom Gates annual released in 2014. This list below shows the Tom Gates book reading order. Book 15 Tom Gates: What Monster? “They are interesting. I like how he does cheeky things, how he follows his dreams cause he plays in a band.” – Bee, 8. The world of Tom Gates book series by Liz Pichon came into my kids lives a few years ago. We were introduced to the books as being good for children with reading difficulties. My daughter who is now 12 has left them behind. At the age of 7, my son was still being given very simple books by his teacher. However, he was able to read the longer Tom Gates books with more confidence. We have made a gradual transition from sharing the reading to me just helping with occasional words. Each page does not have many words on it and so pages turn at a satisfying rate. Each book in the series centres on a week or so of Tom’s life where he goes to school and a close shave adventure happens. Tom lives in a traditional nuclear family – he has one older sister who is a teenager and they ‘hate’ each other. Tom has a band, plays guitar and likes drawing. Most of the story revolves around things that happen at school. There are teachers he likes and doesn’t like, and children who he has difficult relationships with as well as his mates. The books are filled with jokes and really dynamic illustrations. My son will laugh out loud. Tom grows up in each book and the vocabulary develops. Tom Gates author Liz Pichon has added to the collection since my daughter stopped reading them. We have read the first six not always in the ‘right’ order and it doesn’t matter. Each book is complete and stand-alone so it’s easy to access, kids can dip in and out. This is useful when we have picked up books in random order at the library. we have been happy to recommend the books to friends. – Many thanks to Anna for her review and recommendation of the Tom Gates book series. 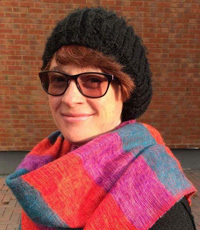 Liz Pichon trained as a graphic designer and has illustrated several picture books. She based a lot of the stories in the Tom Gates books on funny things that happened to her at school. Since her childhood, she has loved drawing and started out by copying her favourite comic book characters. 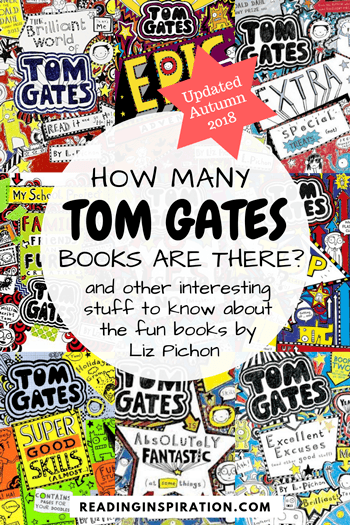 You can find out a lot more about Liz Pichon on her website which also provides updates on new Tom Gates books. Love Tom Gates? Get the t-shirt! Liz Pichon has also designed a funky and fun Tom Gates t-shirt that fans will love. Check it out here. What books make your kids laugh out loud?! We are always on the lookout for recommendations and love to hear from other children and families. What are your family’s favourite reads and what books made your kids laugh? Please mention your reading recommendations in the comments. And why not Contact us directly if you would like to write a full review? If you like the sound of these books and want to find out more, why not check out our full review of Book 12 of the series, Tom Gates: Family, Friends and Furry Creatures here. Angela is a mum who has had plenty of experience of worrying about reading! When she is in the mood for serious reading she loves dystopian and speculative fiction including the works of David Mitchell and Margaret Atwood. But secretly Angela enjoys borrowing all her son's books and shares his love for middle grade fiction, especially fantasy. She has a background in education & publishing and believes all children - no matter what holds them back or where their interests lie - can enjoy wonderful story-telling. Angela has created this blog to provide a resource for families to find great books for the whole family - parents included!